Social media is such an effective way to spread this important message across America and beyond. We’ll share all our updates on Twitter. Follow us to the end! Repin one of the images on our Pinterest site, or pin one of our wonderful images to your Pinterest board. 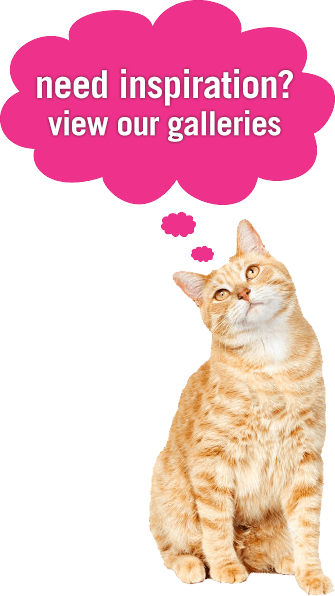 Oh, what a vast array of spay/neuter videos we have to show you! Grab your popcorn, check them out on our YouTube page, and share them with your friends on your social media sites. Pledge to fix your pets by four months here. We hope to get at least 10,000 people to sign on, therefore helping prevent approximately 13,500 litters this year alone. So, you've fixed your pet? That's great! Now spay it forward and get your friends on board, too. Point them to our spay/neuter locator, and get them to pledge to fix their pets too. We have many different images, badges, slogans, and memes to choose from to spread the word about early spay/neuter. There’s something for everyone - take your pick! If you run your own website or blog, why not place a Woulda Coulda Shoulda banner or campaign theme on it? Just upload our image to your server, grab the code and go! Check out our Café Press store online. Simply select the design you like and choose your item (a t-shirt, mug, bumper sticker, or dog apparel). To cut costs, Humane Alliance does not make any profit from the sales. When it comes in the mail, sport it proudly! Shop now! We know that fixing your pet helps get rid of annoying behaviors like heat cycles, yowling, spraying, fighting, and mating. This frees up time for your pet to take on new adventures! Tell us what your pet has time for now that he or she is fixed, by finishing this sentence: “Now that s/he’s fixed, my pet has more time to...” Then post it on your (and our - it'll take about a day to approve it) Facebook and Twitter pages. Get Inspiration! Did you fix your pet already? If so, you belong to the Spay/Neuter Nation, and should be proud to say you did your part! Print off one of the signs from our Download page (or make your own) and post a picture of your fixed pet to our Facebook page (we'll take about a day to approve it), so everyone can see how good your pet looks fixed. Get Inspiration! You know you love taking videos of your kitten and puppy! We want to see them! If your pet was fixed before 6 months of age, take a video of your kitten or puppy bouncing with life after their spay/neuter surgery, to show how little it affects them. Upload it to our YouTube channel, and we may use it in the campaign… Get Inspiration! Take a look at our flash mob tips, and while you’re congregated in a public area, hand out our printable posters to promote the cause or unveil a Woulda, Coulda, Shoulda sign. See our flash mob in action. Want to go old school? Print out one of our information flyers (complete with a new-fangled QR code) and post it in your local coffee shop, library, church, or community hall. Download now! Humane Alliance staff, Joshua Comstock and Hunter Parry, had spay/neuter messages shaved into their heads. 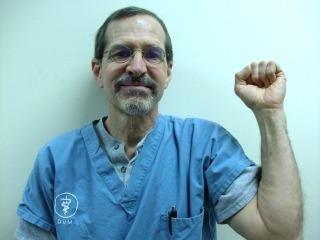 And Dr. Speck, from the Springfield Animal Protection League, actually tattooed himself to show clients the small, green tattoo we give cats and dogs, to identify when they've been fixed. That’s dedication! There are many different spay/neuter clinic models to adopt if you would like to start your own program. Learn more. Sign up for our campaign toolkit, and be an active ally of the campaign. Sign up now. One of our partners, the Humane Society of the United States (HSUS) presents World Spay Day, an international celebration and campaign to raise awareness that spay/neuter saves lives. HSUS also has a limited number of grants to hand out to those wanting to be involved. Help get the little critters to a spay/neuter clinic, and start your own transport group. Humane Alliance has written a manual on how to start the process, and you can see where there’s a spay/neuter clinic near you. Using our template letter, why not contact your local newspaper, informing them about your involvement in the spay/neuter early campaign? Download template. Run a public service announcement on your local radio station. We've put together some wording for you for 15- and 30-second spots. Download scripts. Head to our download page to select a web banner. Upload the image to your website, and make a note of the file path. All photos, videos and any other materials submitted to Humane Alliance ("Materials") become the sole and exclusive property of Humane Alliance and cannot be returned at any time. By submitting Materials, you agree Humane Alliance may, but is not obligated to, use the Materials in connection with the program, in any way, in any medium, worldwide, in perpetuity. Further, you warrant all Materials are 100% original and do not violate the right of privacy or publicity of, or constitute a defamation against, any person or entity; that the Materials will not infringe upon or violate the copyright or common law rights or any other rights of any person or entity; that there are and will be no encumbrances, liens, conditions or restrictions whatsoever upon or affecting such Materials; and that you are at least 18 years of age and the person depicted in the Materials. You agree to indemnify Humane Alliance for all damages and expenses (including reasonable attorney's fees) arising out of any breach or failure of the warranties made herein.